Epiglottis in a sagittal section of the head and neck. From Dorland's, 2000. A leaf-shaped plate of elastic fibrocartilage, covered with mucous membrane, at the root of the tongue, which serves as a diverter valve over the superior aperture of the larynx during the act of swallowing; it stands erect when liquids are being swallowed but is passively bent over the aperture by solid foods being swallowed. The thin elastic cartilaginous structure located at the root of the tongue that folds over the glottis to prevent food and liquid from entering the trachea during the act of swallowing. ep′i·glot′tal (-glŏt′l), ep′i·glot′tic (-glŏt′ĭk) adj. the thin, leaf-shaped cartilaginous structure that overhangs the larynx like a lid and prevents food from entering the larynx and the trachea while swallowing. A leaf-shaped plate of elastic cartilage, covered with mucous membrane, at the root of the tongue, which serves as a diverter valve over the superior aperture of the larynx during the act of swallowing; it stands erect when liquids are being swallowed but is passively bent over the aperture by solid foods that are being swallowed. A leaf-like cartilaginous structure, down behind the back of the tongue, which act as a kind of lid to cover the entrance to the voice-box (larynx) and prevent food or liquid entering it during the act of swallowing. Fig. 151 Epiglottis . The left-side cervical region in humans. a thin flexible structure, made of CARTILAGE, with a leaf-like shape that guards the entrance to the larynx (the glottis) and prevents food material entering the TRACHEA during swallowing, when the larynx is moved upwards under the epiglottis. A leaf-like piece of cartilage extending upwards from the larynx, which can close like a lid over the trachea to prevent the airway from receiving any food or liquid being swallowed. n an elastic cartilage, covered by mucous membrane, that forms the superior part of the larynx and guards the glottis during swallowing. 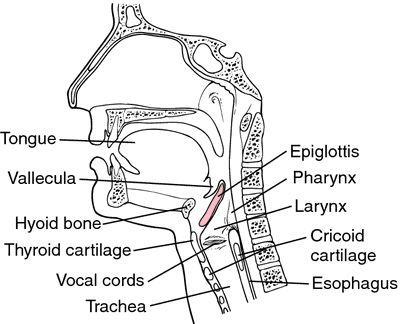 the lidlike cartilaginous structure guarding the entrance to the larynx. The muscular action of swallowing closes the opening to the trachea by placing the larynx against the epiglottis. This prevents food and drink from entering the larynx and trachea, directing it instead into the esophagus. Depth of intubation by Touch and Read method = A1 (from mouth angle to epiglottis tip) + A2 (from epiglottis tip to vocal cords) + 8cm (constant and equal to "P", from the vocal cords to the tube tip) Considering that the mean A2 is 4. This was attributed to a combination of tracheotomy, muscular in-coordination due to pharyngeal repair and limited function of repaired epiglottis. After admission to the Department, a subtotal resection of the epiglottis was performed with an argon plasma scalpel under general endotracheal anesthesia, using directoscopy of the larynx. It was not possible to identify the epiglottis and vocal cords even after several attempts because of the distorted airway anatomy after buccal reconstruction. The epiglottis was grasped and fixed to the hyoid with an Allis clamp. 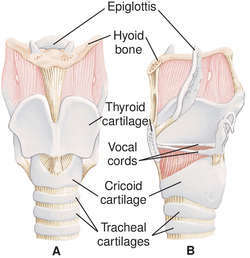 To protect the airway from contents intended for the esophagus, the epiglottis is present as a flap-like roof that arises from the anterior larynx at the level of the hyoid bone. Sub-mucosal tubercles are formed at the site of inoculation, which later ulcerates in areas where epithelium is tightly attached, such as vocal cords, arytenoids and epiglottis. This type of dysphagia also may be due to inadequate movement of the epiglottis, which tilts back to prevent foods and liquids from entering the windpipe when it is functioning properly. When you eat, a flap of tissue called the epiglottis (EP-i-GLOT-is) covers your air tube and sends the food in the right direction. The show runs until January 21 - by which time, surely, the trauma of Lottie's epiglottis will have been safely left behind. That's because When you eat, a tiny flap of tissue, called the epiglottis (eh-pih-GLAH-tis), flops over to cover your windpipe and prevent swallowed food from traveling into your lungs. The lateral soft-tissue view of the neck demonstrates marked enlargement of the epiglottis (FIGURE 3, arrow) in comparison with the patient's normal epiglottis from films taken the year before for neck pain (FIGURE 4, arrow); this is indicative of acute adult epiglottitis.